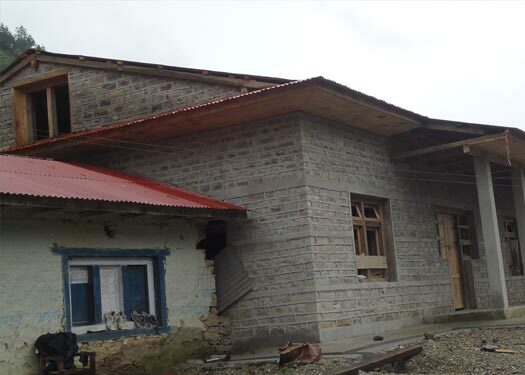 School Construction project by Basa Foundation. Currently the school has 6 rooms and there are 200 childredn, 5 teachers and 1 school staff. Basa foundation has immence concern about the de-forestation and its impact on global warming and climate change. We made some endevours to plant tree in the bare hills of Solukhumbu District. We are not only working on the infrastracure and environment preservation but also raising awareness among the rural people on various aspect of living as well as their surroundings. Many households in rural Nepal are using fire-wood as their prime source of fuel. The traditional oven consume high amount of firewood and produce unhealthy smoke. We had installed advance smoke-controlled oven in these houses. Though Nepal has great potential of Electricity, people in rural village has nightmare about electricity. It is still beyond their capacity so we help them with mini-hydro projects to produce electricity at their own perifiry. Basa foundation is community based non- profit, non-government, non-political and non-religious social organization. This organization aims to up–lift minimum quality of life through the key of education, health and sanitation, environment and culture in backwarded community. Our vision is simply: chances to be assisted, and chances to be involved without any discrimination at any basic global services, amenities and adequate protection or emerging model sustainability to bring progress without destroying their paradise. We want to develop, improve and equipped inclusively taking the way of long term benefit to bring a large change in the life of Back warded people on co- ordination with individually and institutionally.We heartily respect our partners for their supports and suggestions over the projects of human scale; that direct benefit their priorities and concerns. Basa foundation welcomes and thanks you all for your kind efforts and help to bring tangible changes in lives of back warded “Let’s make a grateful life by putting hands over hands”. Our mission is simply: chances to be assisted, and chances to be involved without any discrimination for Education, Health, Sanitation, Construction path/ bridge, school, Environmental awareness and providing training opportunity to develop ..